Tuesday is the last day of the Independent Living Fund. But what is it and who will be affected? Started in 1988, the Independent Living Fund (ILF) has provided financial support to people with disabilities across the UK. From Wednesday, 1 July, it will no longer exist in England, while Wales, Scotland and Northern Ireland have made different plans for the fund. ILF users in England have been protesting since the closure was announced in 2010. A headline-grabbing protest by disabled campaigners and ILF users at Parliament last week could be read as a last-minute attempt to make the government change its mind, but from Wednesday the fund will no longer exist. For what has it been used? The £320m Independent Living Fund currently pays out an average of £300 a week to approximately 18,000 disabled people. The largest group of recipients - about a third - have severe learning disabilities, and the second largest group have cerebral palsy, but it is given to people with many different disabilities. 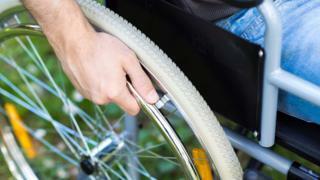 The recipients of ILF are often said to be some of the most severely disabled people in the UK. Predominantly, it has been used to help people pay for carers and personal assistants, and its aim was to ensure that these disabled people could live in their communities, rather than in residential care homes. It has been seen, in the most part, as a top-up fund, giving extra money to disabled people in addition to the benefits they receive from local authorities, to ensure they can afford care. The government says the needs of recipients could be met more effectively by money coming from one, unified system. This is because 94% of the current users already receive benefits from their local authorities, so, according to the government, it makes sense and stops unnecessary bureaucracy, if all funding comes from the same place. The government also says that for some time it has been clear that developments in the delivery of care and support - specifically, that people now receive personal budgets from local authorities - have meant the objective of the ILF could now be better met by local authorities. The ILF has for many years been seen as an anomaly, always operating outside of local authority budgeting. In 1988, when the ILF was set up, it was illegal for local authorities to give money to people directly. But because that has not been the case since 1996, and because local authorities already spend £1.2bn a year to support disabled people of all ages, the government argues it no longer makes sense. Simply put, from Wednesday, people who currently receive support from the local council and the ILF will instead receive all of their support from the local council. The amount of money set aside by the government is also changing. It has said that £262m will be transferred to local authorities, a noticeable reduction from the current £300m. And the money does not have to be ring-fenced, so it could technically be spent by local authorities on other things, and is subject to normal budget cuts. A third of councils responding to Freedom of Information requests from the BBC and the charity Disability Rights UK have said they will ring-fence the money. The government's response to calls to ring-fence the money has been clear: that doing so would prevent local authorities from servicing local needs in a flexible and responsive way. But some people have said this could be a smokescreen for further cuts. Why are disabled campaigners unhappy about the decision? While in theory it may sound as though the lives of the 18,000 disabled people will be unaffected, disabled campaigners say that in practice the picture looks different. They argue that social care budgets are being squeezed more than ever, and that the decision is just a way for the government to make further cuts. Some say they have been told by their local authorities to expect cuts in what they receive. They are worried local authorities may make decisions based on costs. Twenty-four-hour care in the home for an individual is estimated to cost £1,700 a week, whereas the comparative cost of a local authority care home for an adult with a disability is about £850 a week. Everybody was supposed to have received assessments before the handover, but some disabled people say they are still waiting for theirs, causing uncertainty and anxiety. Protesters say this is a backward step because it took a lot of campaigning from disabled people to create the fund in the first place. In Scotland a new, national ILF has been created that will protect users' current awards, as long as they remain eligible. And in May, it was announced that payments to the approximately 600 ILF recipients in Northern Ireland would also be administered through ILF Scotland. The Welsh government has decided to transfer responsibility and funding to local authorities in Wales but has put in place conditions for the money. It has secured money for the 1,648 people receiving ILF in Wales, to keep the same support until March 2016, and then funding is subject to the next Spending Round. The Minister for Health and Social Services, Mark Drakeford, has said that if funding is secured again, then he will reconsider the steps needed to develop a new Welsh ILF body as a longer-term solution. How has it reached this stage? There has been an ongoing legal battle between disabled people and the government over the ILF, which was only resolved in December 2014. Five disabled ILF users brought a case against the government's plans to scrap the fund, in 2013, questioning the legality of the decision on the basis that the consultation into how it would work had been inadequate and had failed to fulfil its public-sector equality duty. The High Court found that the closure was lawful, but this decision was later overturned by the Court of Appeal. The government then decided it would not appeal and ministers began to reconsider the future of ILF. But the Department for Work and Pensions conducted fresh equalities analysis following the Court of Appeal's decision, which resulted in the government announcing once more, in March 2014, that the ILF would close. A fresh legal challenge from ILF users was brought against the decision but was ultimately unsuccessful, and in December 2014, the High Court ruled it was lawful once again, and plans for the closure went ahead. So this has been going on since the decision to close it in 2010 was announced, and it does not feel as though disabled people will quieten even after the fund has closed.